Blended with just the right proportion of golden Virginia and Burley, the basic blend of toasted Cavendish tobaccos takes on a zesty dimension. An aromatic blend of Black Cavendish, Burley and Virginia tobaccos with flavors of cream, honey, molasses, nougat, sweet sugar and vanilla. This mixture gets better as you smoke it all day long. A Golden Cavendish blend but with a hint of Fire-Cured blended it provides scintillating taste and flavorful aroma. An aromatic blend of Cavendish and Virginia tobaccos featuring a vanilla flavor. A very mild Cavendish tobacco laced with just the right amount of vanilla casing. Great for the occasional pipe smoker. Blended Cavendish tobacco with a hint of cherry. A slightly sweet blend with no bite. Beautiful aroma and slow burning. 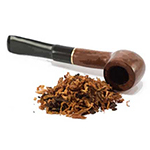 Fire-cured Cavendish tobaccos discreetly flavored to produce an extremely mild, slow burning cool smoke. An aromatic blend of Black Cavendish and Cavendish tobaccos with subtle flavorings of alcohol, liquor, cocoa, chocolate, vanilla and whiskey. Our best-selling aromatic blend with just the right amount of vanilla. Smooth as can be and outstanding aroma. Blended since 1976.